The 2019 Gerald Micklem Trophy held last week at Woking Golf Club, proved once again to be an enjoyable event. On the Thursday morning, Charterhouse beat Rugby School 4-1 in the first round of the plate competition. After a hearty lunch, Charterhouse faced Stowe in the plate final. This match proved to be as close a contest as one could possibly imagine. A special mention should be made of Carthusian golfer Thyme Thirapornsawad who won his match playing at number 2 in his first participation in the Gerald Micklem. A very high standard was set by Tor Olafsson, the Charterhouse golf captain and his opponent from Stowe as both number one players birdied their opening hole and went on to par the next. Tor used all of his quality and experience to prevail against a very talented golfer. In the fourth match, Jack Rockey again showed his consistency and composure to win 2 & 1 in another tight match. Henry Shipton and Maxi Zhang both played some good golf in their matches but were ultimately up against the fine quality shown by both Stowe golfers who were also very gracious players. The tie was finely poised for some genuine sporting drama, which came thanks to a remarkable comeback from Max Joyston-Bechal, who at two down with two to play remained undiminished. 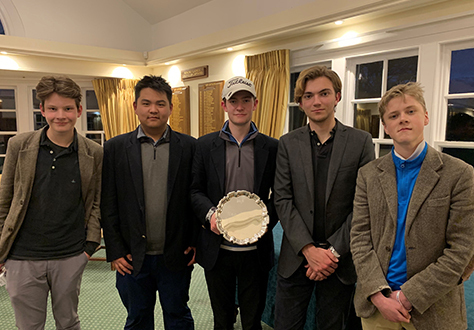 Max showed true grit and determination as he managed to square the match and force the tie into a play-off on the 18th hole, thus securing a victory for the Charterhouse team. A fantastic achievement, well done to all pupils and staff involved.